Dude, Where’s My Car Interior Space? The 1970s were tough times for the U.S. auto industry. There were a whole host of government regulations along with high fuel costs that had U.S. automakers in rapid change mode. And if you don’t believe this to be the case, you only need to look at the average car in 1970 and then compare it to the average car in 1979 – you will surely see the drastic change. The first change you will notice is how rapidly cars shrunk over this decade (mostly due to the mandated EPA CAFE standards). As an example, the best selling 1970 model year Ford car was the full-size Ford (Galaxie 500, LTD, Custom, and XL). Production for the 1970 full-size Ford was 850,315 (with 351,938 Galaxie 500s being the most popular full-size Ford car choice). Fast forward to 1978, and Ford’s most popular car was the new compact size Fairmont (460,981 were produced for 1978) versus the full-size 1978 Ford (LTD and similar full-size models) had a total production of 308,284 units. Indeed by 1978, the times were a changing. 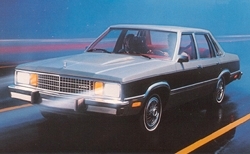 The Fairmont marked the first rollout of Ford’s new Fox body which would later become the new platform for the Mustang, Thunderbird, and other future Ford cars. The Fox body was a light and compact rear wheel drive platform that would help Ford reduce the weight of its future cars (which helped to improve fuel efficiency). The Fairmont was the replacement for the Ford Maverick. 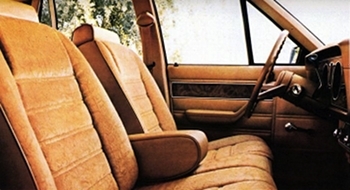 Unlike the Maverick, the Fairmont had no body curves, its styling was boxy which was the new trend starting in the late-1970s, and by the 1980s would be used by many different cars. To make sure it covered all the bases, Ford offered four different Fairmont models: a 4-door sedan, 2-door sedan, a 5-door station wagon, and the sporty 2-door Fairmont Futura. The Fairmont was new territory for Ford, the basic 4-door and 2-door sedan with its boxy styling and formal roofline was ahead of its time. A few years later, Chrysler would copy the Fairmont sedan’s boxy styling on its popular K-cars with much success. However where Ford was different than the competition, was that its ultra shrunken Fox body platform was rear-wheel drive. As previously mentioned Chrysler when it released the all-new K-cars for 1981, they were all front-wheel drive. GM also when it came out with its shrunken A-body offerings for 1982 (which also happened to use boxy styling and were about the same size as the Fairmont), they too were front-wheel drive. Having rear wheel drive gave the Fairmont (which had a length of 193 inches and a wheelbase of 105 inches), the added advantage of being marketed as an economy car that could be used for police and taxi service. Police agencies and taxi companies have traditionally preferred rear-wheel drive cars over front-wheel drive cars due to their lower cost of maintenance and superior reliability under heavy duty use. The station wagon version used the same single headlight setup on each side of the pedestrian front grille that the 4-door and 2-door sedan used. The styling of the sedan and station wagon didn’t win any beauty prizes, however it still was appealing. Styling was modern for its day but a little too plain Jane for enthusiasts. Most buyers didn’t care since the Fairmont was an very roomy compact economy car with a very low base price ($3,710 for the 4-door sedan). However Ford with the Fairmont Futura (the Futura name was borrowed from the 1960s Ford Falcon model), decided to shake things up a bit. The Futura had sporty styling and was only available as a two-door. The Futura was the only 1978 Fairmont to use a quad headlight setup and a more elegant grille. This alone gave the Futura a more upscale look than the other Fairmont models. However it was the Futura’s sporty roofline with semi-fastback styling that really set it apart from the other Fairmont models. The roofline was the same design that Ford first introduced on the popular 1977 Thunderbird. 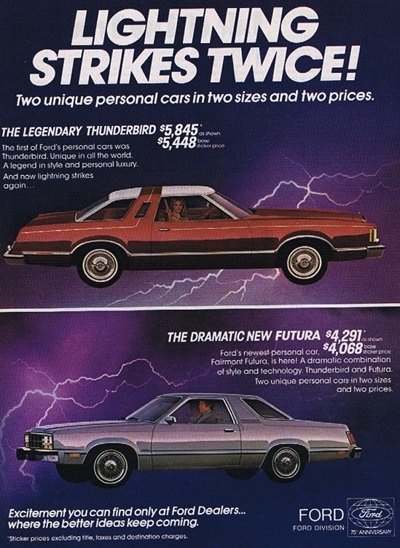 Ford knew the Futura’s Thunderbird style roofline would be a big draw, it even had a magazine ad called "Lightning Strikes Twice" where potential customers were shown how the 1978 Thunderbird and a 1978 Futura used the same type of roofline design. To go with the flashy roofline the Futura also used a sporty rear-end design (also similar to the Thunderbird), which added a full 4 inches to the Futura versus the Fairmont. Since the Fairmont was a compact car it was no surprise a small displacement engine was standard in the form of a 140 CID (2.3 liter) 4-cylinder which produced 88 horsepower. Optional was an 85 horsepower 1-bbl 200 CID (3.3 liter) inline-6 cylinder. This 6 cylinder may have had 3 horsepower less than the 4-cylinder, but it made up for this deficit with a healthy 154 lb-ft torque rating (the 2.3 liter had only 118 lb-ft of torque). Both engines provided very good fuel efficiency, which was what a lot of customers wanted in the late-1970s. As far as transmissions were concerned the 2.3 liter 4-cylinder was available with a floor mounted 4-speed manual or a 3-speed automatic. The 3.3 liter 6-cylinder could be equipped with either a 3-speed manual, a 4-speed manual, or 3-speed automatic transmission. Ford could have left the Fairmont with just these two engine choices and would have still sold a record breaking number of Fairmonts to customers, however it threw into the mix for good measure a 302 CID (5.0 liter) V8 option. Which was a welcome option especially considering the Fairmont’s weight (depending on model) was between 2,590 to 2,748 lbs. Even so these were the dark days at Ford for performance, the 5.0 liter V8 was rated at 139 horsepower but provided a good deal of low-end torque – 243 lb-ft to be exact. The problem was the 5.0 liter was relegated to just a 2-bbl carburetor. The 5.0 liter V8’s mission was to provide good low end torque along with smooth acceleration. Tire burning acceleration was not part of the equation back in 1978. Even so the 5.0 liter still gave the Fairmont good acceleration for its day. Also helping to cripple the 5.0 liter was the mandatory 3-speed automatic. It’s a pity that Ford could have not at least offered a floor mounted 4-speed manual with the 5.0 liter in the sporty Futura and the Fairmont Sedan, it would have added some performance spice. A 4-bbl carburetor option, some other engine performance upgrades, and a performance dual outlet exhaust system may have pushed the Futura and Fairmont Sedan into performance car territory. Unfortunately Ford was asleep at the switch and this was all a big missed opportunity. Ford would eventually see the light but not until 1984 with the release of the Fairmont based 4-door Ford LTD LX which had a high performance fuel injected 5.0 liter H.O. V8, dual outlet exhaust, and a great handling touring suspension – it was a genuine 1980s muscle car. Ford had done its homework with the Fairmont, it was the best handling compact car it had made up until that time. The suspension, surprising was not what you would expect on a budget car, it was well tuned. The cornerstone of the setup was the McPherson front strut suspension which would be a staple of American performance cars during the 1980s. 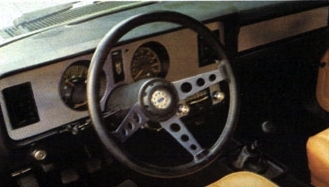 Steering was also better than one would have expected of an economy car of the late-1970s. The Fairmont overall had a nimble and surefooted feel in tight turns, compared to most compact cars of this era. The Fairmont’s interior was roomy for a smaller car. Interior dimensions were in fact larger than the bigger Maverick. And a wide array of different style vinyl and cloth seating options were available. Buyers could also pick from either a front bench seat and or sporty bucket seats. Interesting to note any 1978 Fairmont equipped with the 2.3 liter came standard with bucket seats. Anyone familiar with the 1979-1986 Fox body Mustang will recognize the 1978 Fairmont’s stylish dashboard design and gauge layout which the two shared. It can’t be stressed strong enough how roomy the Fairmont was for its compact size – there was virtually no wasted space in this car. When ordered with a front bench seat, the Fairmont could fit 6 full-size adults. And the trunk space on the sedan was a whopping 16.8 cubic feet. As a comparison the full-size 2012 Chrysler 300 has 16.3 cubic feet of trunk space. For performance oriented buyers there may not have been a hot performance car version, but there was the next best thing – the E.S. package which was available only on the Fairmont 2-door and 4-door sedan. With the E.S., the Fairmont was transformed into an automobile with European touring car flair. Most of the Fairmont E.S.’s trim was blacked out, this included the front grille, the two outside mirrors, cowl grille, and the external lower back panel. And to add to the sporty effect the E.S. had black louvered panels behind the rear side windows. In the interior the the dashboard and other panel pieces were also black. The E.S. also consisted of a three spoke sporty steering wheel, a dash with grey engine turning panels to accent the dashboard, and other special items. However the hidden gems in the package were a rear stabilizer bar and special tuned suspension which gave the E.S. superior handling over the standard Fairmont suspension. The key to the E.S. was checking off the right options on the order sheet. Along with the E.S. package, if you checked off – bucket seats, the 5.0 liter V8, and the flashy 14 inch aluminum wheels (with performance Goodyear performance radial tires with white lettering) you had a quasi-muscle car that looked the part. Even with no manual transmission or dual exhausts an E.S. equipped with the 5.0 liter with 139 horsepower still weighed well under 3,000 lbs which meant it could hold its own against some of late-1970s performance cars. Interesting to note, Ford would offer a 4-speed manual with the 5.0 liter V8 on the 1979 Fairmont option list. The 1978 Fairmont was a massive hit for Ford, in fact it was Ford’s most successful new car launch in terms of sales than any other Ford product before it – it even outsold the 1964 1/2 Mustang. The Fairmont would also usher in the Fox body era for Ford. The Fairmont was in every category a big improvement over the Maverick and every other previous Ford compact for that matter. The late-1970s was a period of hard economic times for many Americans, and Ford understood this. Ford adapted to the times with exact precision by offering a forward thinking compact car that was well built. In the same way the K-car saved Chrysler in the 1980s, the Fairmont was the car that put Ford back on track – a streak which has continued to this day. The Fairmont name may be long gone from the Ford new car lineup but during its short tenure it made a big dent in U.S. automobile history.